Welcome to the Mealthy app, your new favorite recipe app and kitchen companion! Featuring thousands of tasty recipes (including hundreds of pressure cooker recipes), tips for all dietary needs and types, step-by-step recipe videos, easy recipe search and browse, appliance registration, how-to videos, in-depth articles, and more! Mealthy is here to bring fun, ease, and enjoyment into your recipes and mealtimes, and we have designed our recipes, app, and appliances for you. If you’re using a pressure cooker, air fryer, blender, immersion blender, or spiralizer, we’ve got recipes for you! If you want vegetarian recipes, vegan recipes, gluten-free recipes, Paleo recipes, keto recipes, low-sugar recipes, or looking for family meals, organic meals, healthy cuisine recipes or just fast, easy, and delicious dishes, we’ve got it. Healthy recipes have never been so easy to find and make, thanks to the Mealthy app! • Vegetarian Mode – No meat? No problem! Select vegetarian mode to view only tasty vegetarian recipes. • Discover – Search recipes by diet, meal type, ingredient, and even by appliance! Have a pressure cooker? Use Discover to find our pressure cooking recipes. Air fryer? No problem, we’ve got plenty of those, too! Immersion blender or blender? We’ve got you covered. Our recipes feature exportable ingredients list with food you probably have on-hand, full color photos, step-by-step recipe instructions, and tips to get even more from your favorite recipes. 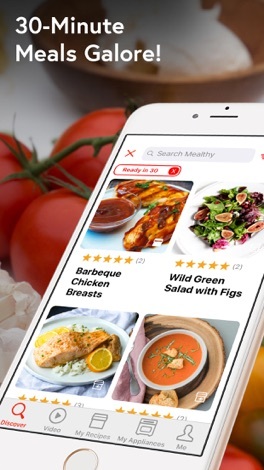 • Thousands of recipes – Mealthy’s ever-growing recipe library of original, tasty recipes caters to all dietary needs, including vegetarian recipes, vegan recipes, low-sugar recipes, gluten-free recipes, Paleo recipes, keto recipes, organic recipes, and more. Whether you’re looking for recipes for healthy dinner on a weeknight, indulgent cheat-day recipes, or something in between, we’ve got recipes for you. Our recipes also come with tips to make your cooking easy, healthy, and fast. We’ve designed our app to include pressure cooker, air fryer, blender, immersion blender, and spiralizer recipes just for you. • Videos – Our videos bring recipes to life and inspire by showing you a recipe for a dish made from fresh ingredients. Videos are full of tips and tricks and guide you easily through the cooking process. Bought a pressure cooker but need some guidance? We’ve got videos for that, too! Simply click on the Videos tab to visit our ever-growing video collection. We know your time is limited, so we like to keep our recipe videos short and sweet while still keeping all the direction you need. • Recipe box – Save those tasty recipes to your recipe box to revisit later. Export recipe ingredient lists to your notes to create a shopping list. Recipes in your recipe box are easy to find later. • Sharing – Want to share great recipes or video recipes? Use the share feature to easily message recipes. Your completed recipes are easily shareable with friends and family. • Appliances – upgraded your old Instant Pot to the Mealthy MultiPot? Great! Register your new appliance and find amazing pressure cooker recipes. Want to get rid of your old pressure cooker and find an easier way to make pressure cooker recipes? Click My Appliances to learn about the Mealthy MultiPot, Handblend, and other appliances. Our appliances help you make fast, delicious, and healthy recipes with ease. Pressure cooker recipes, air fryer recipes, blender recipes, spiralizer recipes, slow cooker recipes, and more are all easily accessible through the appliance tab! Get healthy, tasty, easy dinner recipe videos featuring your favorite healthy, tasty foods and cooking methods, tasty recipe how-to videos, tasty pressure cooking video tips and tricks, meal prep planning tips and recipes, cooking videos, and more with the Mealthy app. All tailored to your MultiPot or Instant Pot. Mealthy is the ultimate recipes app and kitchen helper. Recipes having never been so inspiring, accessible, or easy as with Mealthy!